DESCRIPTION: TOBRADEX® (tobramycin and dexamethasone ophthalmic suspension) is a sterile, multiple dose antibiotic and steroid combination for topical ophthalmic use. Each mL of TOBRADEX® (tobramycin and dexamethasone ophthalmic suspension) contains: Actives: tobramycin 0.3% (3 mg) and dexamethasone 0.1% (1 mg). Preservative: benzalkonium chloride 0.01%. Inactives: tyloxapol, edetate disodium, sodium chloride, hydroxyethyl cellulose, sodium sulfate, sulfuric acid and/or sodium hydroxide (to adjust pH) and purified water. CLINICAL PHARMACOLOGY: Corticoids suppress the inflammatory response to a variety of agents and they probably delay or slow healing. Since corticoids may inhibit the body's defense mechanism against infection, a concomitant antimicrobial drug may be used when this inhibition is considered to be clinically significant. Dexamethasone is a potent corticoid. Staphylococci, including S. aureus and S. epidermidis (coagulase-positive and coagulase-negative), including penicillin-resistant strains. Streptococci, including some of the Group A-beta-hemolytic species, some nonhemolytic species, and some Streptococcus pneumoniae. Pseudomonas aeruginosa, Escherichia coli, Klebsiella pneumoniae, Enterobacter aerogenes, Proteus mirabilis, Morganella morganii, most Proteus vulgaris strains, Haemophilus influenzae and H. aegyptius, Moraxella lacunata, Acinetobacter calcoaceticus and some Neisseria species. Bacterial susceptibility studies demonstrate that in some cases microorganisms resistant to gentamicin remain susceptible to tobramycin. No data are available on the extent of systemic absorption from TOBRADEX® (tobramycin and dexamethasone ophthalmic suspension); however, it is known that some systemic absorption can occur with ocularly applied drugs. If the maximum dose of TOBRADEX® (tobramycin and dexamethasone ophthalmic suspension) is given for the first 48 hours (two drops in each eye every 2 hours) and complete systemic absorption occurs, which is highly unlikely, the daily dose of dexamethasone would be 2.4 mg. The usual physiologic replacement dose is 0.75 mg daily. If TOBRADEX® (tobramycin and dexamethasone ophthalmic suspension) is given after the first 48 hours as two drops in each eye every 4 hours, the administered dose of dexamethasone would be 1.2 mg daily. 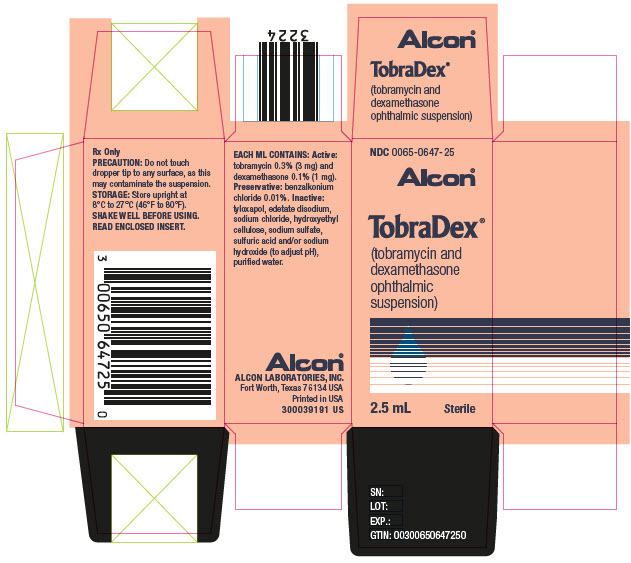 INDICATIONS AND USAGE: TOBRADEX® (tobramycin and dexamethasone ophthalmic suspension) is indicated for steroid-responsive inflammatory ocular conditions for which a corticosteroid is indicated and where superficial bacterial ocular infection or a risk of bacterial ocular infection exists. Ocular steroids are indicated in inflammatory conditions of the palpebral and bulbar conjunctiva, cornea and anterior segment of the globe where the inherent risk of steroid use in certain infective conjunctivitides is accepted to obtain a diminution in edema and inflammation. They are also indicated in chronic anterior uveitis and corneal injury from chemical, radiation or thermal burns, or penetration of foreign bodies. CONTRAINDICATIONS: Epithelial herpes simplex keratitis (dendritic keratitis), vaccinia, varicella, and many other viral diseases of the cornea and conjunctiva. Mycobacterial infection of the eye. Fungal diseases of ocular structures. Hypersensitivity to a component of the medication. WARNINGS: FOR TOPICAL OPHTHALMIC USE ONLY. NOT FOR INJECTION INTO THE EYE. Sensitivity to topically applied aminoglycosides may occur in some patients. If a sensitivity reaction does occur, discontinue use. Prolonged use of steroids may result in glaucoma, with damage to the optic nerve, defects in visual acuity and fields of vision, and posterior subcapsular cataract formation. Intraocular pressure should be routinely monitored even though it may be difficult in pediatric patients and uncooperative patients. Prolonged use may suppress the host response and thus increase the hazard of secondary ocular infections. In those diseases causing thinning of the cornea or sclera, perforations have been known to occur with the use of topical steroids. In acute purulent conditions of the eye, steroids may mask infection or enhance existing infection. General. The possibility of fungal infections of the cornea should be considered after long-term steroid dosing. As with other antibiotic preparations, prolonged use may result in overgrowth of nonsusceptible organisms, including fungi. If superinfection occurs, appropriate therapy should be initiated. When multiple prescriptions are required, or whenever clinical judgement dictates, the patient should be examined with the aid of magnification, such as slit lamp biomicroscopy and, where appropriate, fluorescein staining. Cross-sensitivity to other aminoglycoside antibiotics may occur; if hypersensitivity develops with this product, discontinue use and institute appropriate therapy. Information for Patients: Do not touch dropper tip to any surface, as this may contaminate the contents. Contact lenses should not be worn during the use of this product. Carcinogenesis, Mutagenesis, Impairment of Fertility: No studies have been conducted to evaluate the carcinogenic or mutagenic potential. No impairment of fertility was noted in studies of subcutaneous tobramycin in rats at doses of 50 and 100 mg/kg/day. Pregnancy: Corticosteroids have been found to be teratogenic in animal studies. Ocular administration of 0.1% dexamethasone resulted in 15.6% and 32.3% incidence of fetal anomalies in two groups of pregnant rabbits. Fetal growth retardation and increased mortality rates have been observed in rats with chronic dexamethasone therapy. Reproduction studies have been performed in rats and rabbits with tobramycin at doses up to 100 mg/kg/day parenterally and have revealed no evidence of impaired fertility or harm to the fetus. There are no adequate and well controlled studies in pregnant women. TOBRADEX® (tobramycin and dexamethasone ophthalmic suspension) should be used during pregnancy only if the potential benefit justifies the potential risk to the fetus. Nursing Mothers. Systemically administered corticosteroids appear in human milk and could suppress growth, interfere with endogenous corticosteroid production, or cause other untoward effects. It is not known whether topical administration of corticosteroids could result in sufficient systemic absorption to produce detectable quantities in human milk. Because many drugs are excreted in human milk, caution should be exercised when TOBRADEX® (tobramycin and dexamethasone ophthalmic suspension) is administered to a nursing woman. Pediatric Use. Safety and effectiveness in pediatric patients below the age of 2 years have not been established. Geriatric Use. No overall differences in safety or effectiveness have been observed between elderly and younger patients. ADVERSE REACTIONS: Adverse reactions have occurred with steroid/anti-infective combination drugs which can be attributed to the steroid component, the anti-infective component, or the combination. Exact incidence figures are not available. The most frequent adverse reactions to topical ocular tobramycin TOBREX® (tobramycin ophthalmic solution) are hypersensitivity and localized ocular toxicity, including lid itching and swelling, and conjunctival erythema. These reactions occur in less than 4% of patients. Similar reactions may occur with the topical use of other aminoglycoside antibiotics. Other adverse reactions have not been reported; however, if topical ocular tobramycin is administered concomitantly with systemic aminoglycoside antibiotics, care should be taken to monitor the total serum concentration. The reactions due to the steroid component are: elevation of intraocular pressure (IOP) with possible development of glaucoma, and infrequent optic nerve damage; posterior subcapsular cataract formation; and delayed wound healing. Secondary Infection. The development of secondary infection has occurred after use of combinations containing steroids and antimicrobials. Fungal infections of the cornea are particularly prone to develop coincidentally with long-term applications of steroids. The possibility of fungal invasion must be considered in any persistent corneal ulceration where steroid treatment has been used. Secondary bacterial ocular infection following suppression of host responses also occurs. OVERDOSAGE: Clinically apparent signs and symptoms of an overdosage of TOBRADEX® (tobramycin and dexamethasone ophthalmic suspension) punctate keratitis, erythema, increased lacrimation, edema and lid itching may be similar to adverse reaction effects seen in some patients. DOSAGE AND ADMINISTRATION: One or two drops instilled into the conjunctival sac(s) every four to six hours. During the initial 24 to 48 hours, the dosage may be increased to one or two drops every two (2) hours. Frequency should be decreased gradually as warranted by improvement in clinical signs. Care should be taken not to discontinue therapy prematurely. HOW SUPPLIED: Sterile ophthalmic suspension in 2.5 mL (NDC 0065-0647-25), 5 mL (NDC 0065-0647-05) and 10 mL (NDC 0065-0647-10) DROP-TAINER® dispensers. STORAGE: Store at 8°C to 27°C (46°F-80°F). Store suspension upright and shake well before using.